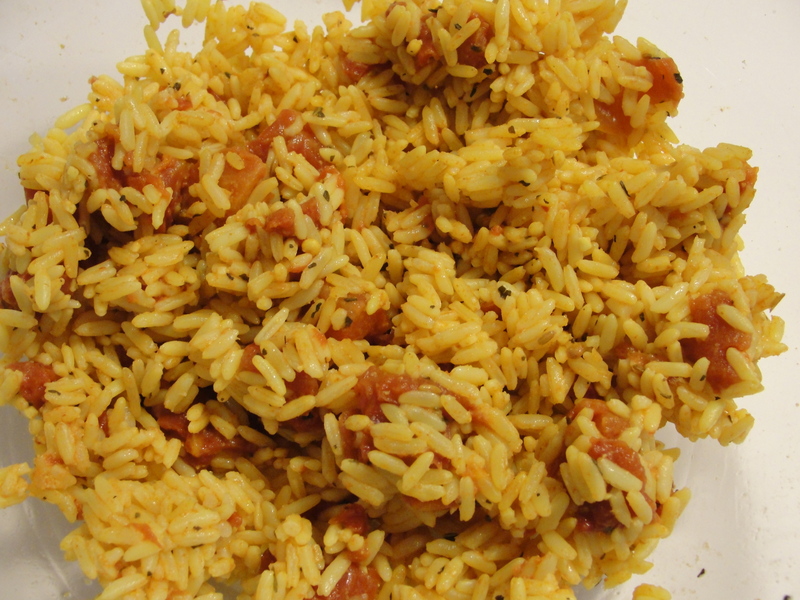 I am embarrassed to tell you all that until the other night, I’d never made my own Spanish rice. Despite our frequent meals of fajitas and tacos and enchiladas, I’d never attempted the side dish. Ours always came out of the box. Last week, I went to make fish tacos and opened my pantry, and there was no box. We were all out of Spanish rice. I stood there for a minute, drumming my fingers on the cabinet door and chewing on the corner of my mouth, pondering the situation. And then I thought about what I knew was in Spanish rice, figured “how hard could it be?”, shrugged a bit (I have fantastic conversations with myself, gestures included), and pulled a few things out to hit the stove. Heat up a small saucepan over medium heat and give it a shot of olive oil to just coat the bottom. Stir together your rice, onion, and garlic, and let it toast for a minute or two. Add in everything else except the salt and pepper. Bring to a boil, lower heat to low, put a slightly-askew lid on the pot to let a tiny bit of steam out, and cook until the rice is tender, stirring after about 10 minutes (mine was done in about 20, but your stove’s power and pot thickness may change this). Salt and pepper to taste and enjoy! Yesterday finally, finally felt like spring. Oh sure, it was cloudy (again), but the trees finally burst open with buds and flowers and my windows were open and a breeze filled my house with fresh air, and I dared to put the winter coats away (don’t tell!!). Time for some lighter food. Spring means asparagus. You can buy it all year these days, ’tis true, but it’s best right now, when it’s local and soft and at its freshest peak in the market. So I bought a big bundle and brought it home and started searching for jumping-off points to incorporate it into a light, fresh dinner. This started as a recipe from Food Network, and we really enjoyed it. I messed with some of the liquids and spices in it, added lemon (They wrote an asparagus recipe without lemon, and the fruit compliments the vegetable so well that I had to add it back in. ), and fiddled with proportions in a few places. This is light and tasty without being overpowering, and I am very much looking forward to leftovers tonight. This would be great with other green vegetables, either in addition to or in place of the asparagus if you don’t like asparagus for some reason. Broccoli, snap peas, or even those long French green beans would be delicious in this. Just be sure to not overcook them on their first run through the pan. You want that fresh-veggie crunch in the finished dish. I served it over rice, but it would be really good over rice noodles, too. In a large bowl, whisk together the soy sauce, wine, 1 tsp of the cornstarch, and half the garlic and ginger. Stir the chicken into this and let it marinate in the fridge for a half-hour, or on the counter for 15 minutes. Heat up a large skillet or wok over medium-high heat. Add the oil, and then stir-fry the asparagus, scallions, half the garlic and half the ginger. Remove from the pan as soon as they’re bright green and crisp, and almost tender (they’ll cook a little more in a minute). Put your tablespoon of cornstarch into a bowl and slowly whisk the chicken broth into it, so you don’t get lumps. 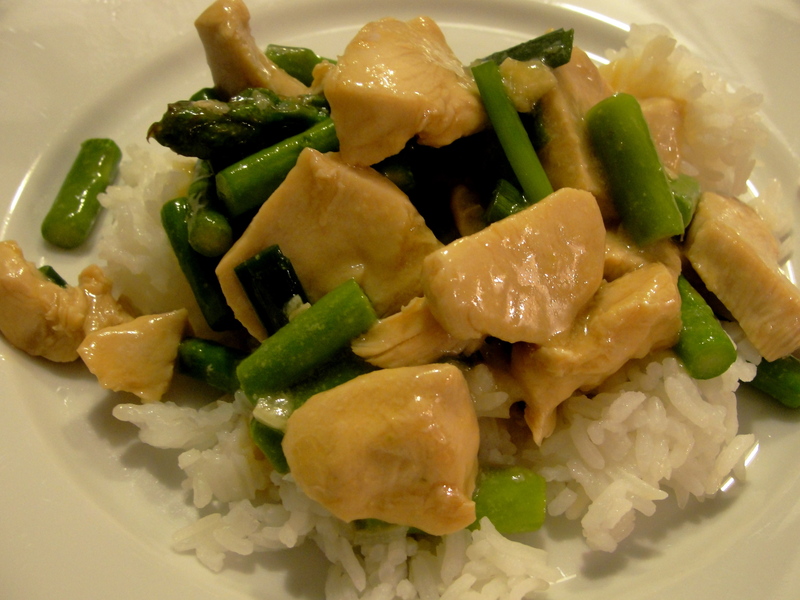 Pour the chicken mixture into the hot pan and stir-fry until the chicken is slightly brown and just cooked through. Stir the veggie mixture back into the chicken in the pan. Stir in the broth mixture and cook until it thickens up, which is about three minutes. Salt to taste and serve over rice. You know those days you just have to bake something? Banana bread calls, right? Only there are no brown bananas in the house–only fresh yellow ones that don’t make for yummy baked goods. 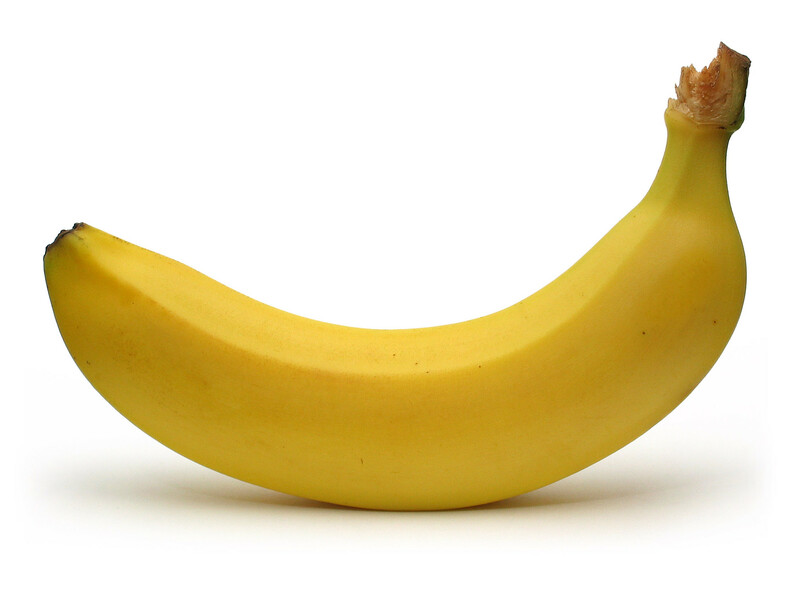 Pick up a yellow banana and squeeze it. Be gentle–you don’t want to bust open the skin. But give the fruit a good massage, squishing it in your fist until you can feel that it’s all mushy inside there. And then, open the skin and dump the mushed-up nanner into your mixing bowl. I know. Those frozen garlic bread logs in the freezer at the grocery store are really easy. Lay them on a baking sheet, pop them in the oven, give them 15 minutes, and voila. Buttery, garlicky, carby goodness. Guess what? Making it yourself is even faster. Pinky swear. You need a small handful of ingredients and about 10 minutes for this, and the bread is crunchy on the outside and soft on the inside, and the best part is that you haven’t ingested tons of preservatives or an astounding amount of fat. My kids love this. Beg for it. Which leads me to a secret I’ll share with you if you promise not to tell: I make this out of regular sandwich bread when I haven’t had time to grab a loaf of Italian at the store’s bakery. It’s just as good and takes garlic bread from a sometimes-treat to a regular indulgence (and a whole-wheat indulgence if you roll that way). I use garlic bread seasoning I buy from The Spice Hunter. You can also use plain garlic powder with a sprinkle of Italian seasoning. It’s all good. Line a baking sheet with foil. Pre-heat your broiler, on low if it has settings, and by just turning it on if not. Put your oven rack in the middle slot of your oven. Lay your slices of bread on the baking sheet. Butter one side and sprinkle it with the spices. Put that under the broiler for just a few minutes, until it starts to golden-brown up. Take it out. Flip the slices over. Butter the other side, sprinkle them with the spices, and then sprinkle them with the Parmesan. Put the bread back under the broiler for a minute until you see golden brown. Enjoy. We revived the big Sunday dinner last night, and I have to tell you, by the time this was all cooked up and ready, I was singing. Out loud, with wild abandon, completely content and happy. Tell me that doesn’t rock. It was a busy weekend. School fundraisers and baseball games and neighborhood parties and family commitments (and I had a few hours of real/paying work to do) and all sorts of things that led to my feeling like I couldn’t breathe by about 2:00 on Sunday. We were in a trillion different directions all weekend, and when DH came home from an outing after lunch and asked me where we’d go to dinner, and I realized I had one more meeting yet to attend last night, I grabbed the car keys and headed out to the store. “I’m cooking,” I said. And I did–a big, traditional Sunday dinner that I made up on the fly based on a dish DH told me he’d had while visiting a friend in Florida a few weeks ago. Said friend epitomizes everything you’ve ever heard about New York Italians, and with him in my head, dinner was born. Friends, it was spectacular. If I do say so my darned self. We all gathered around the table and connected, chatting and just breathing for a little while. And the chopping and cooking and stirring while listening to my kids shooting hoops out in the driveway was completely cathartic. Just what I needed. 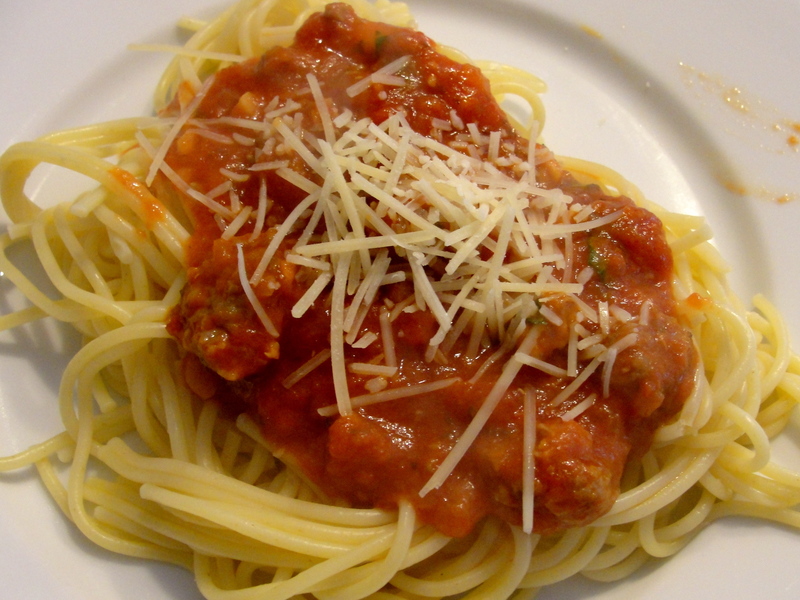 In a large pot of salted water, cook your spaghetti to al dente. Drain. In a large skillet or medium saucepan, heat the olive oil until it shimmers, over medium heat. Add the onions and cook until they start to soften. Stir in the garlic, give it a minute, and then add the sausage and cook, stirring occasionally, until it’s browned on the outside. Stir in oregano. Pour the crushed tomatoes and diced tomatoes (drain them well) into the onion/sausage mixture, stir well, and lower the heat to low. Let this simmer as long as you can–mine went about a half-hour. Just before serving, stir in the basil. Serve over the hot spaghetti. 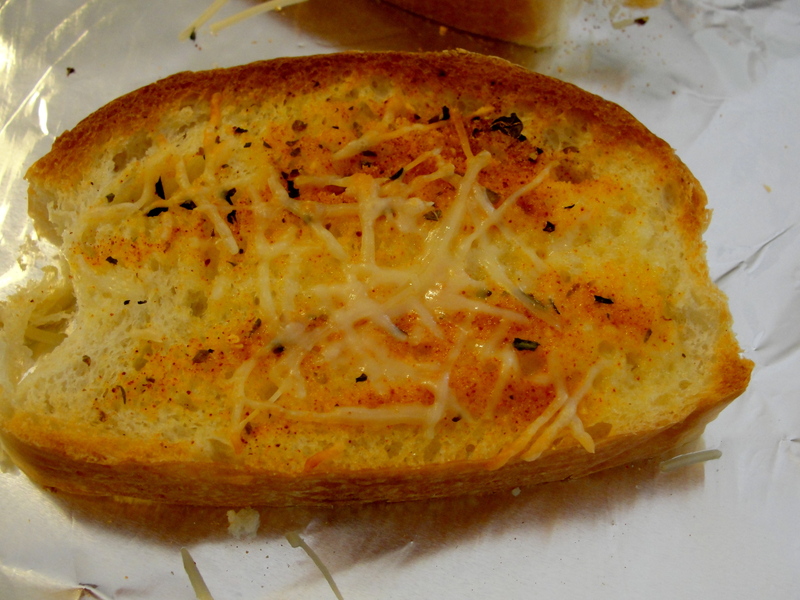 We had this with my super-simple garlic bread–I’ll show you that one tomorrow! How many of you, now that it’s April, are in a lunchbox rut? 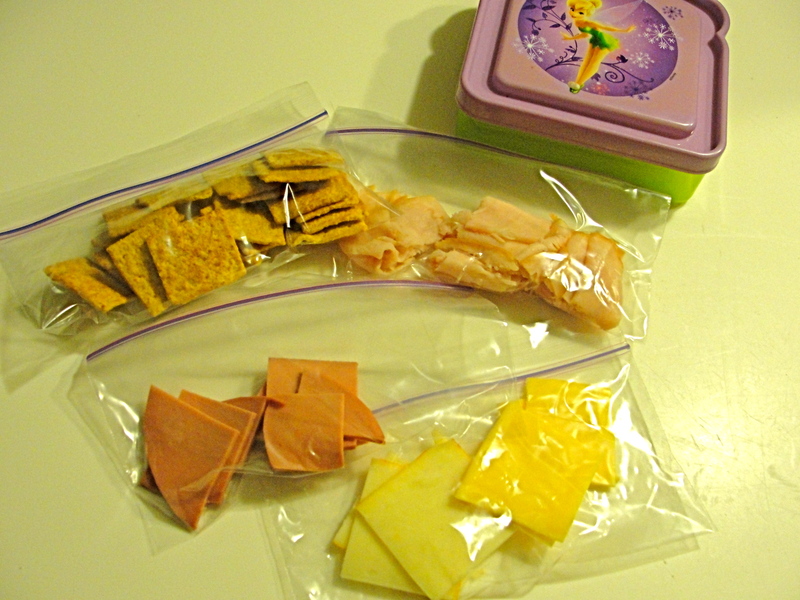 How many of our kids are starting to scowl when they eye their lunches on the counter before school, knowing it’s the same old sandwich or Thermos o’ pasta in there? And how many of us could use some new ideas? My kids are forever begging me to buy Lunchables. I am forever refusing (have you ever read the ingredients in those things? Or figured out the price-per-plastic-package? *shudder* No thank you very much.). The concept, though, is a great one. They do make lunchtime more fun, in theory. And there’s a super-simple solution to both giving in without really giving in and in shaking up the lunchbox a bit. I’ll admit I was a little nervous the first time I cut up some meat and cheese, bagged the slices up with some whole-wheat crackers, and sent them in my daughter’s sandwich box. (I have a Bento box on order to ditch the baggies before the Green Police come after me.) DIY anything was a terrible social sin when I went to grade school, and I was slightly afraid she’d catch an earful from her table-mates. Know what the first thing out of a child’s mouth was? I like this because I control the ingredients, and I can use up the little bits of lunch fixings that are left at the end of the school week. My kids like it because they get to “make” their own lunch, playing with different ingredients and eating with their fingers (bonus!) Today’s DIY Lunchable has one slice of bologna, cut into sixths; three slices of turkey, cut into thirds; and a slice each of American and Muenster cheese, quartered; plus some wheat crackers. This works with any meats, cheeses, or veggies you have in the fridge. Healthy, easy, economical, fun, and not the same old thing. It’s a winner. Today, I have a question for all of you, and am hoping you’ll all chime in on this one–the more, the merrier. We have a first communion this spring. Ceremony at church with a little family soiree at my house afterwards. I’ll want to feed people, which is normally no problem. But we have a hiccup: The ceremony is at 11:30, which will put me back home around 1 with a house full of hungry people with little patience for me to heat something up. Last time, I did pulled chicken in the Crock pot with some potato rolls and cold sides. It was fantastic, but it’s the same crowd this time and I’d rather do something different. I thought about slow cooker lasagna, but we have two lactose-sensitive folks who can’t have all the cheese. We’re not big cold-cut eaters, either. So–help a girl out, woulja? Please (pretty please) leave me a comment with your suggestions. I can’t wait to hear! !